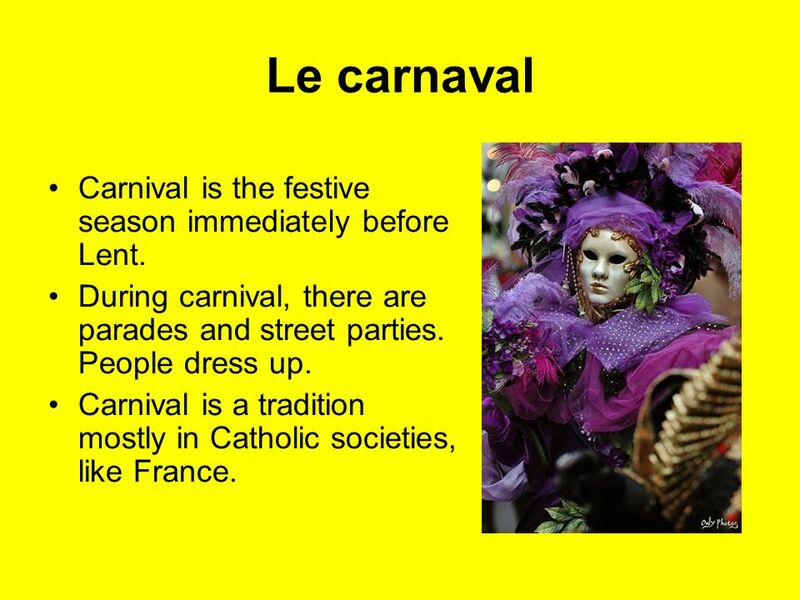 2 Le carnaval Carnival is the festive season immediately before Lent. During carnival, there are parades and street parties. People dress up. 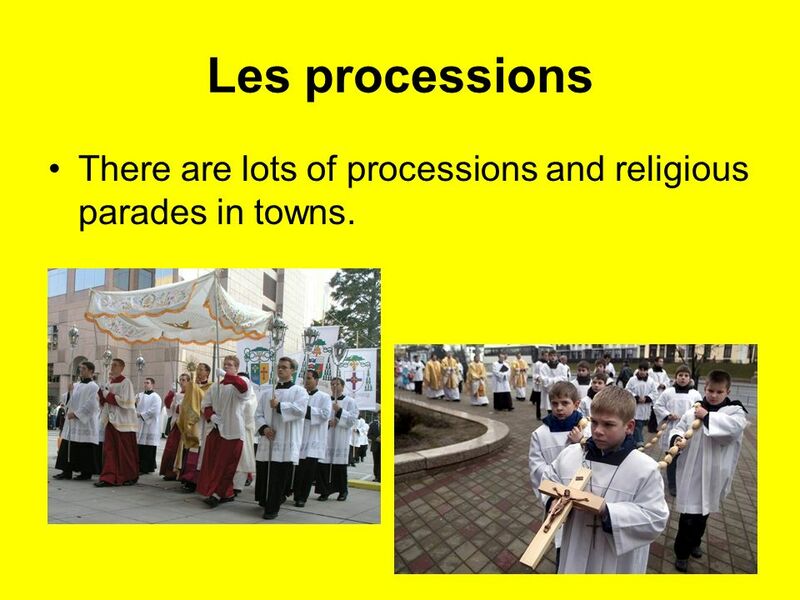 Carnival is a tradition mostly in Catholic societies, like France. 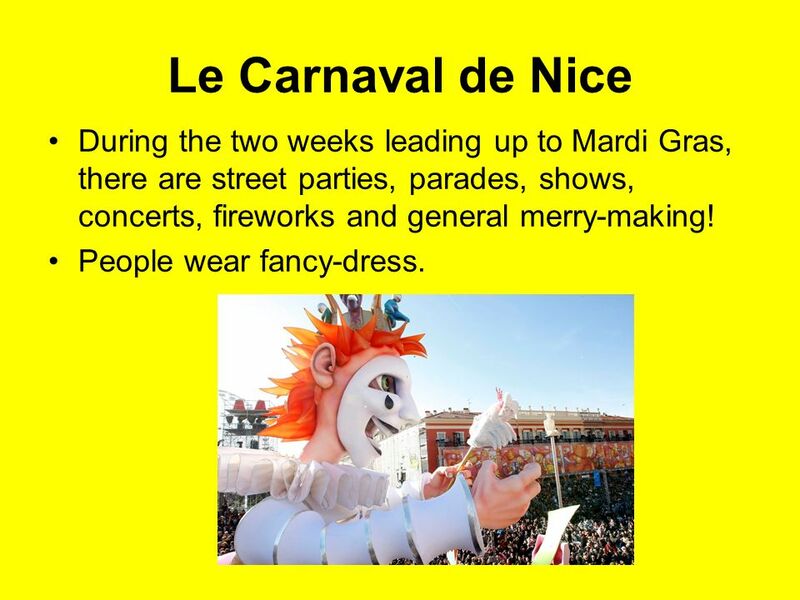 3 Le Carnaval de Nice In the city of Nice, in the south of France, there is a very famous carnival every year. 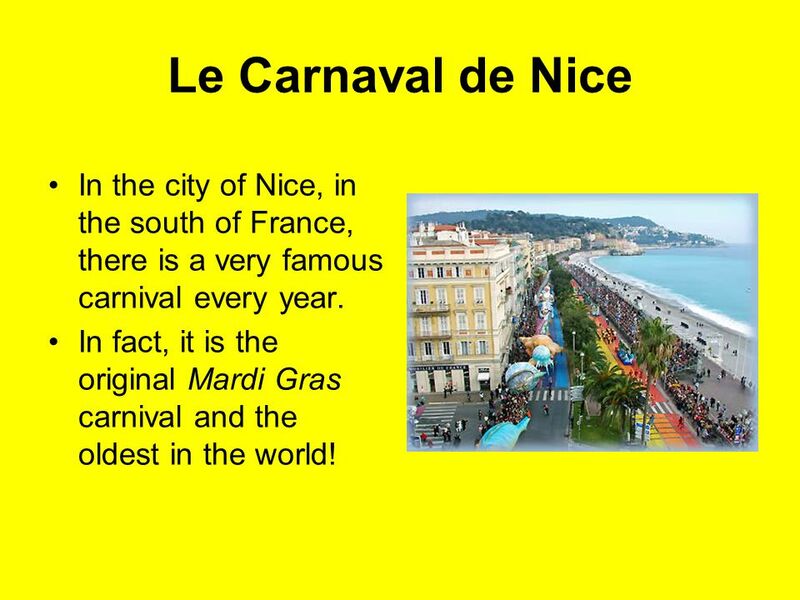 In fact, it is the original Mardi Gras carnival and the oldest in the world! 4 Le Carnaval de Nice During the two weeks leading up to Mardi Gras, there are street parties, parades, shows, concerts, fireworks and general merry-making! People wear fancy-dress. 5 Le Carnaval de Nice Each year, the Nice carnival has a theme. 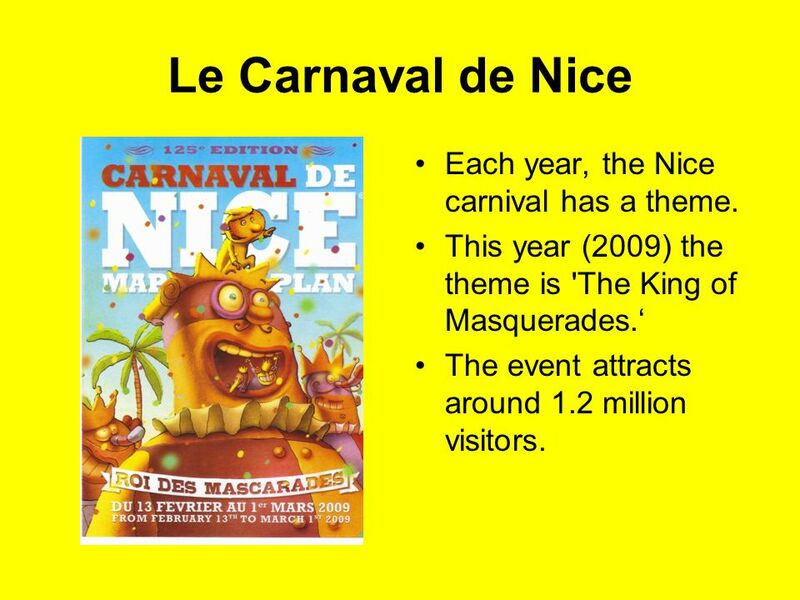 This year (2009) the theme is 'The King of Masquerades.‘ The event attracts around 1.2 million visitors. 6 Mardi Gras The carnival period finishes with Mardi Gras. 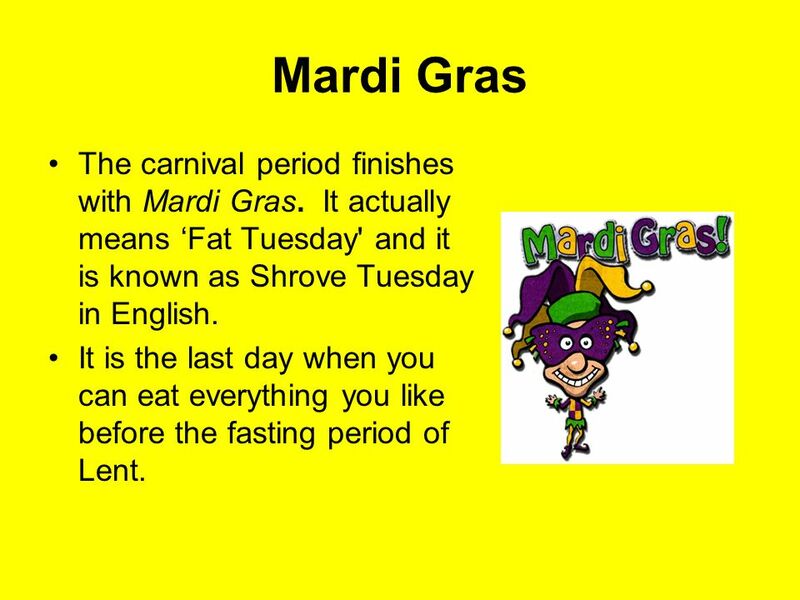 It actually means ‘Fat Tuesday' and it is known as Shrove Tuesday in English. It is the last day when you can eat everything you like before the fasting period of Lent. 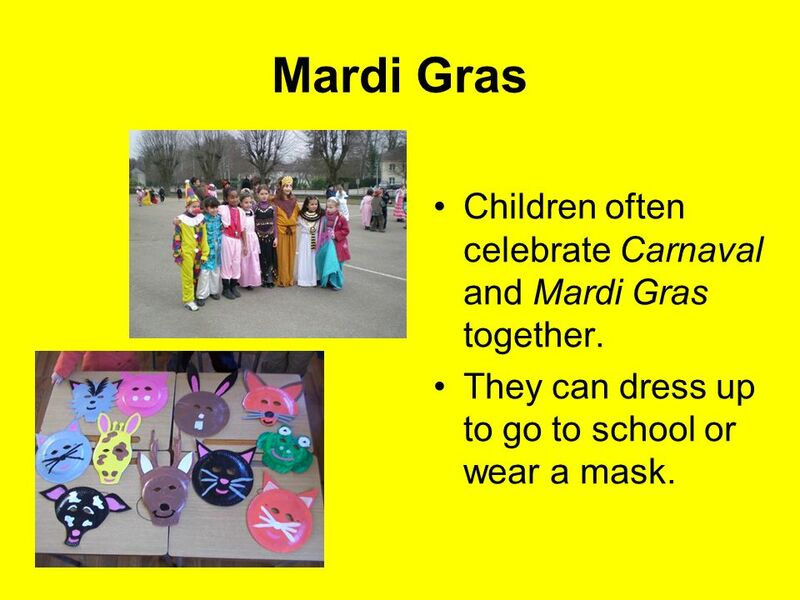 7 Mardi Gras Children often celebrate Carnaval and Mardi Gras together. They can dress up to go to school or wear a mask. 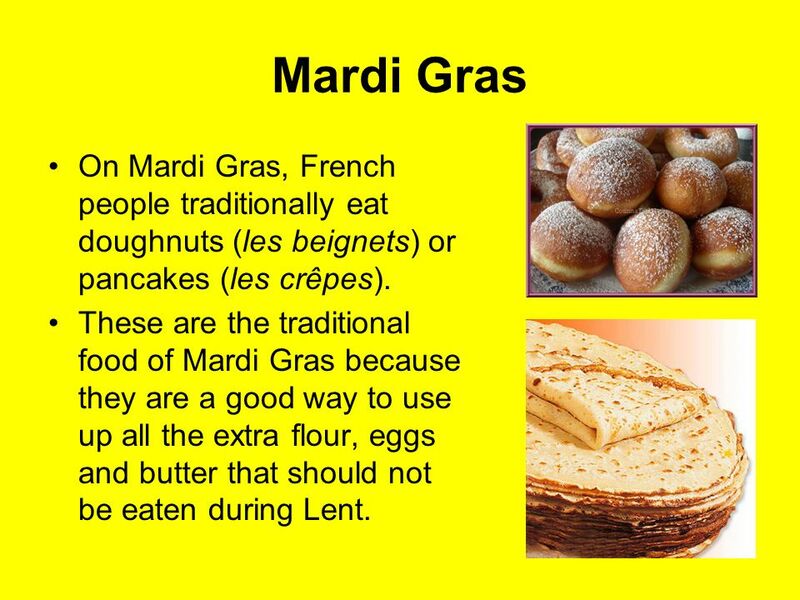 8 Mardi Gras On Mardi Gras, French people traditionally eat doughnuts (les beignets) or pancakes (les crêpes). These are the traditional food of Mardi Gras because they are a good way to use up all the extra flour, eggs and butter that should not be eaten during Lent. 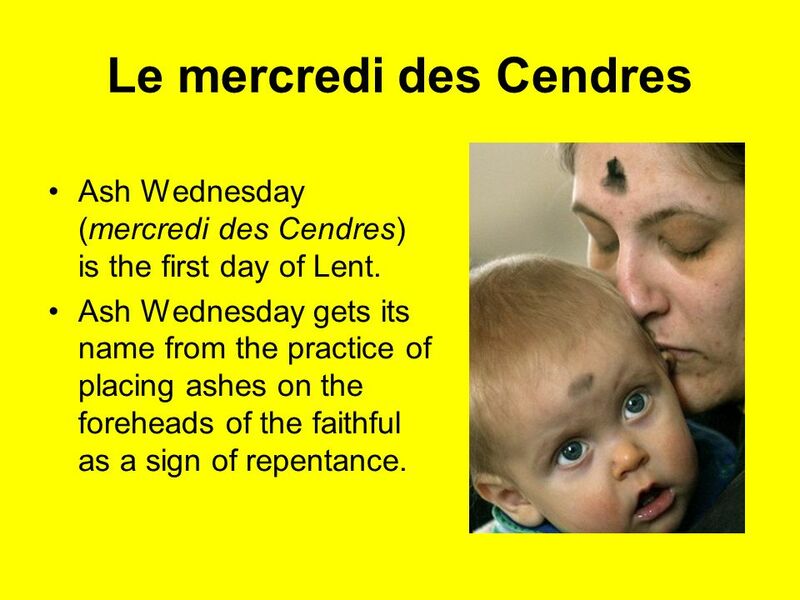 Ash Wednesday (mercredi des Cendres) is the first day of Lent. Ash Wednesday gets its name from the practice of placing ashes on the foreheads of the faithful as a sign of repentance. 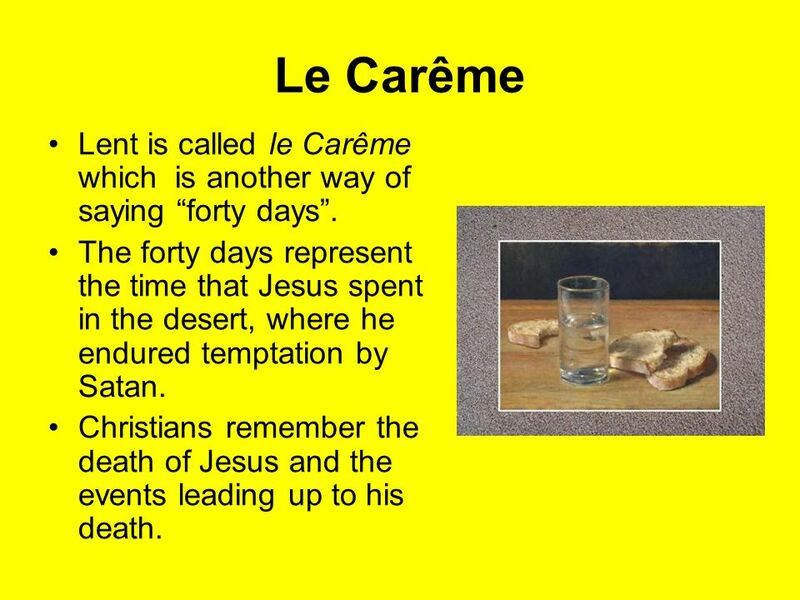 10 Le Carême Lent is called le Carême which is another way of saying “forty days”. The forty days represent the time that Jesus spent in the desert, where he endured temptation by Satan. Christians remember the death of Jesus and the events leading up to his death. 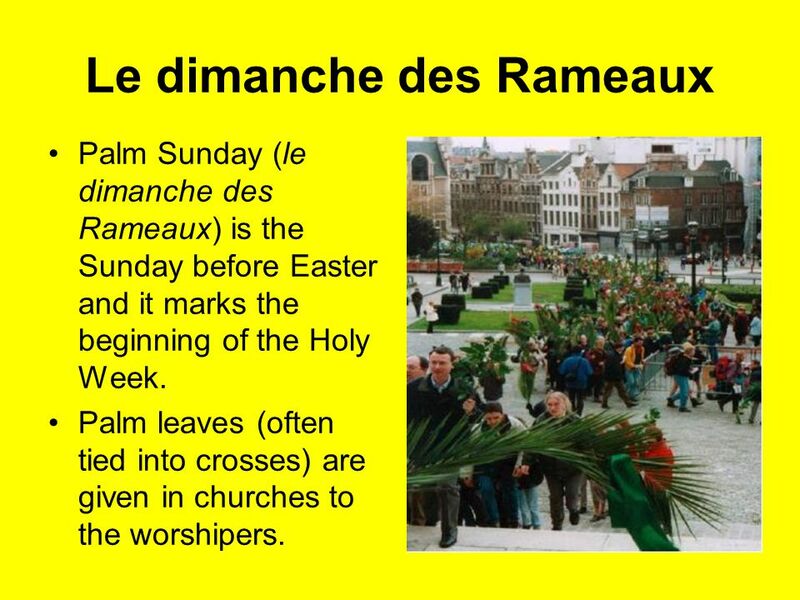 Palm Sunday (le dimanche des Rameaux) is the Sunday before Easter and it marks the beginning of the Holy Week. Palm leaves (often tied into crosses) are given in churches to the worshipers. 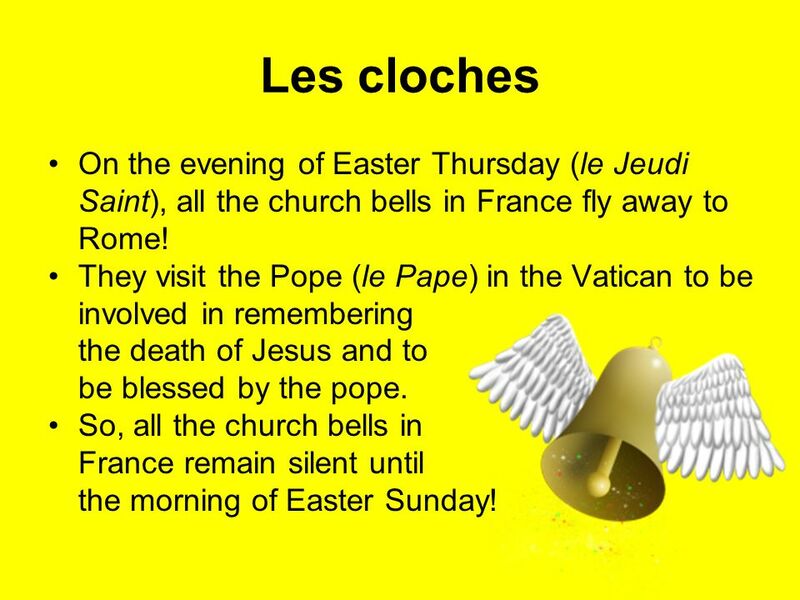 12 Les cloches On the evening of Easter Thursday (le Jeudi Saint), all the church bells in France fly away to Rome! They visit the Pope (le Pape) in the Vatican to be involved in remembering the death of Jesus and to be blessed by the pope. 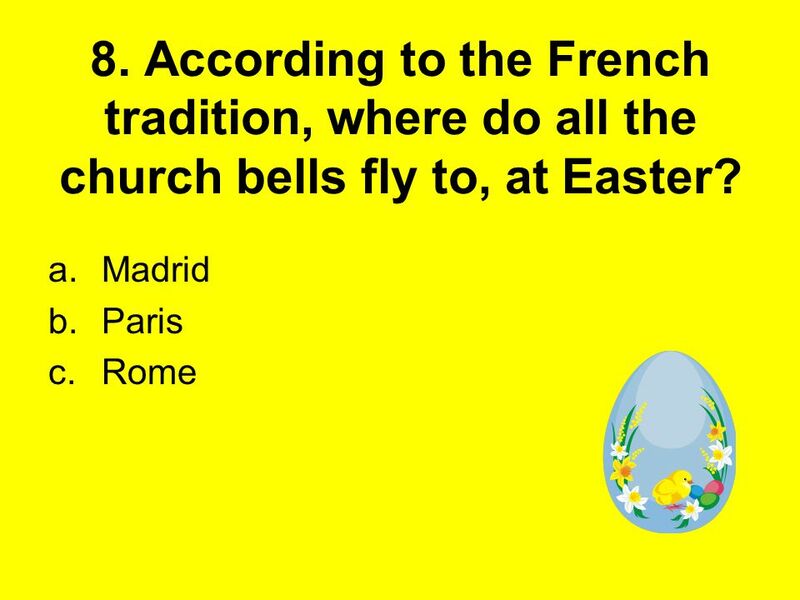 So, all the church bells in France remain silent until the morning of Easter Sunday! 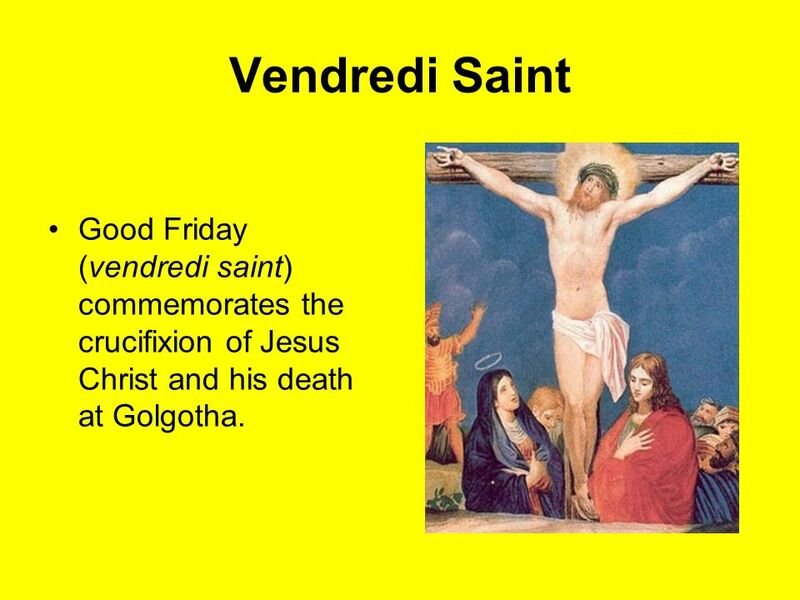 13 Vendredi Saint Good Friday (vendredi saint) commemorates the crucifixion of Jesus Christ and his death at Golgotha. 14 Les processions There are lots of processions and religious parades in towns. 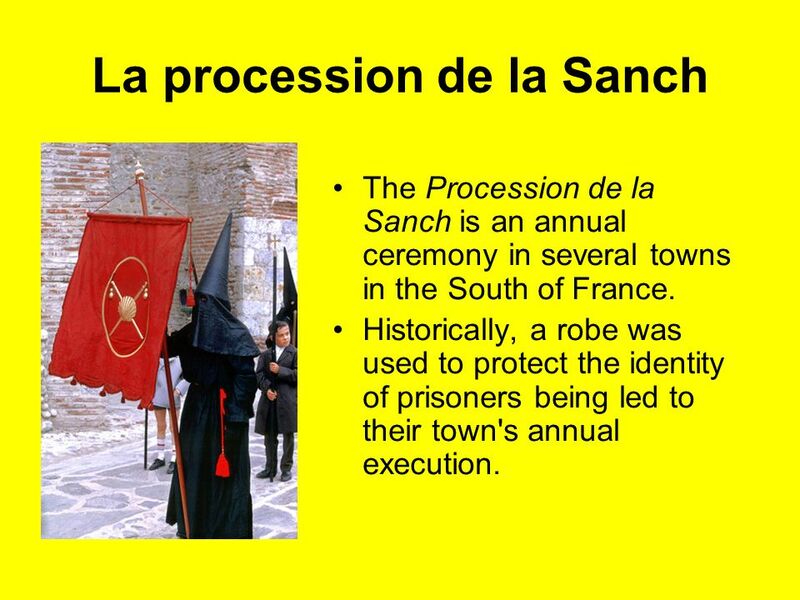 The Procession de la Sanch is an annual ceremony in several towns in the South of France. Historically, a robe was used to protect the identity of prisoners being led to their town's annual execution. 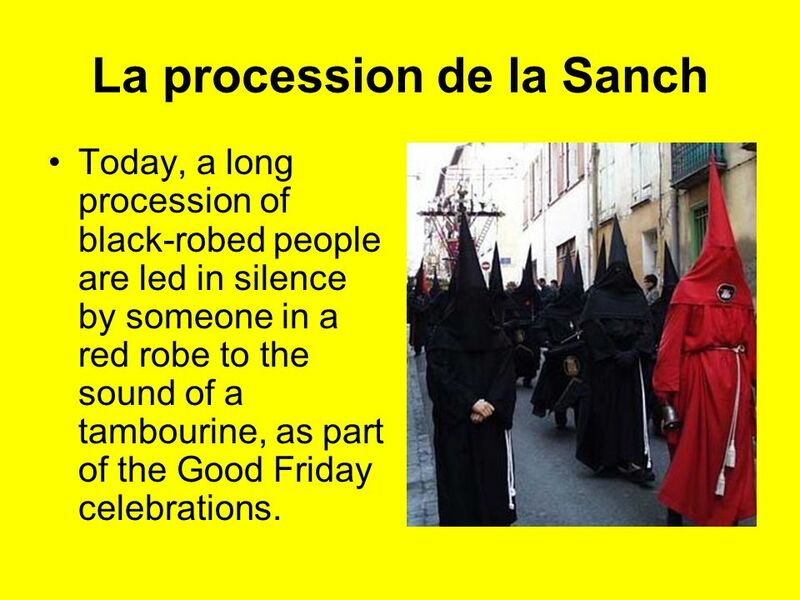 Today, a long procession of black-robed people are led in silence by someone in a red robe to the sound of a tambourine, as part of the Good Friday celebrations. 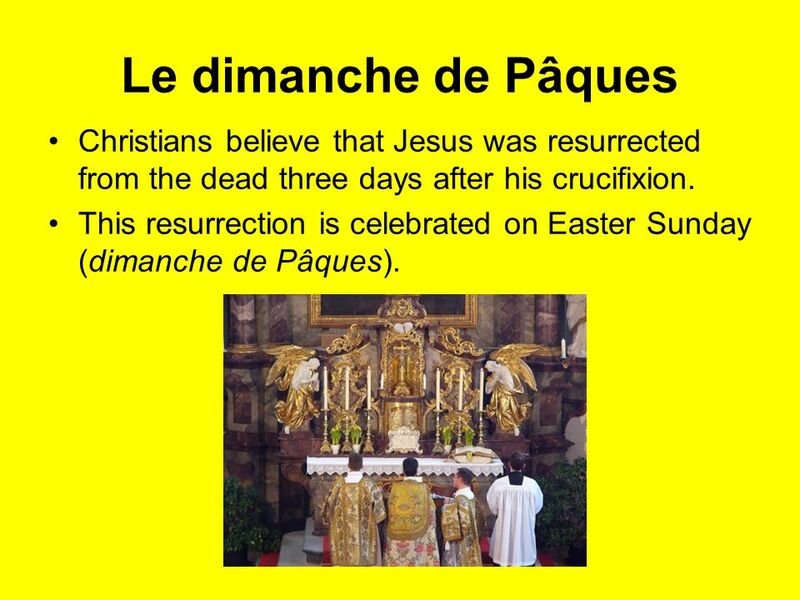 17 Le dimanche de Pâques Christians believe that Jesus was resurrected from the dead three days after his crucifixion. 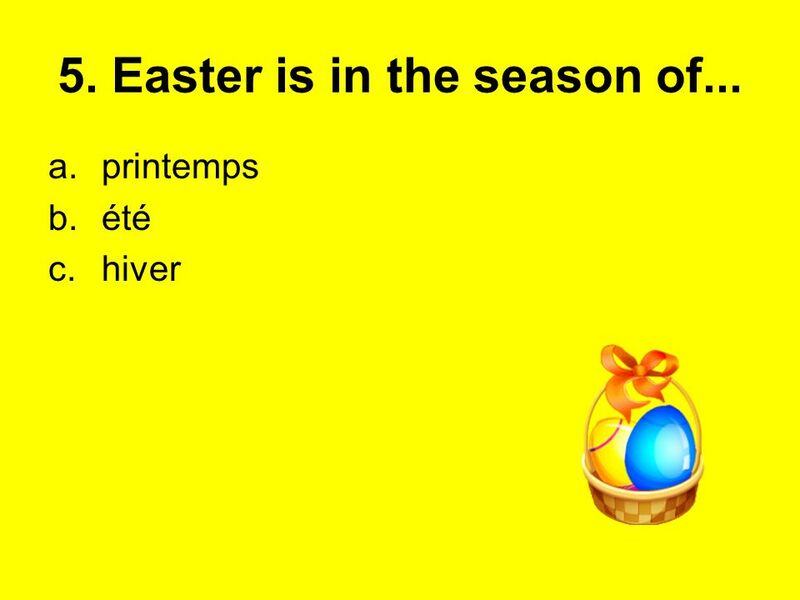 This resurrection is celebrated on Easter Sunday (dimanche de Pâques). 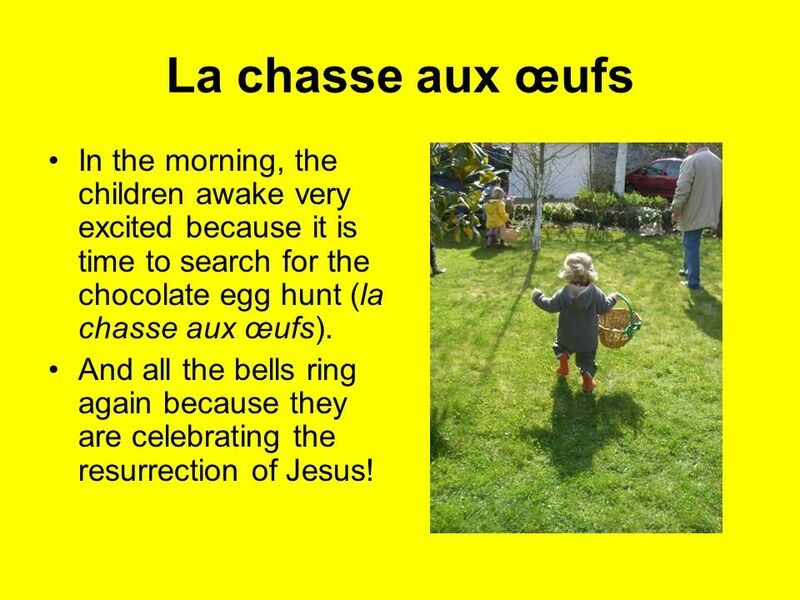 18 Le dimanche de Pâques Early on the morning of Easter Sunday , the Easter bells (les cloches de Pâques) fly back to France! 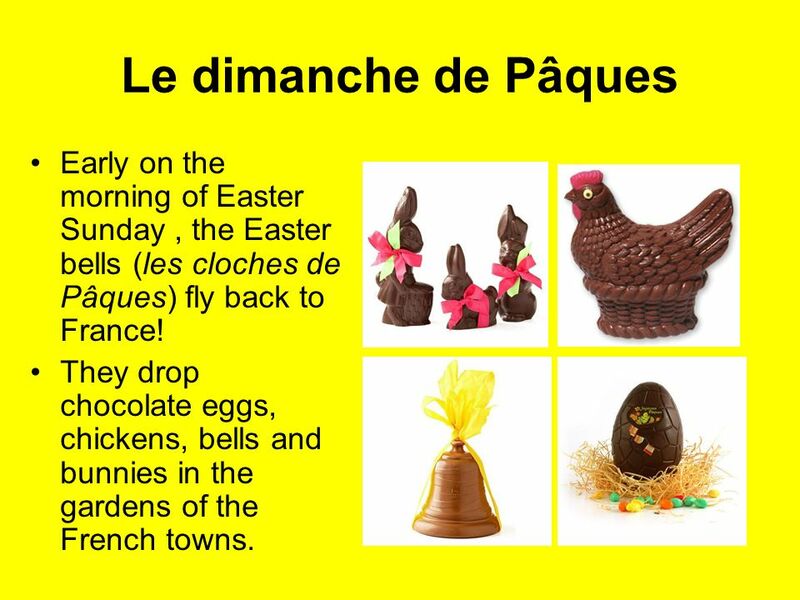 They drop chocolate eggs, chickens, bells and bunnies in the gardens of the French towns. 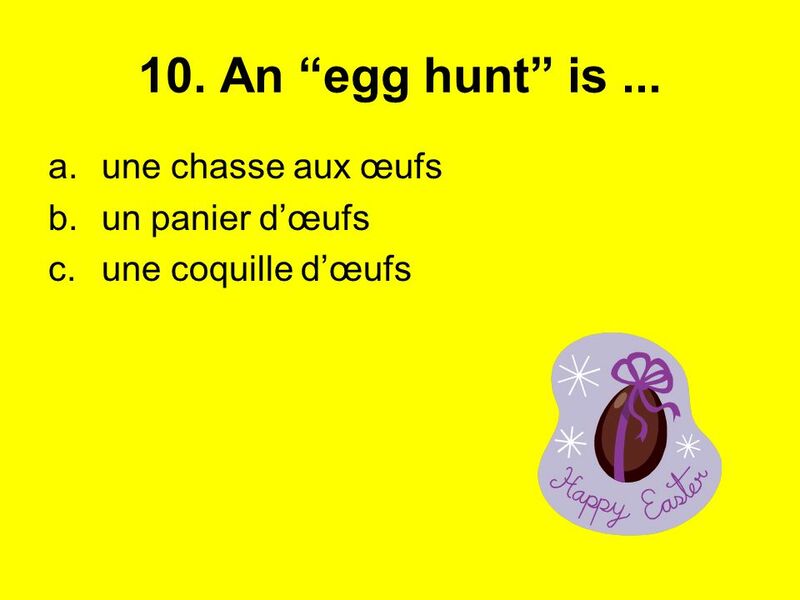 19 La chasse aux œufs In the morning, the children awake very excited because it is time to search for the chocolate egg hunt (la chasse aux œufs). And all the bells ring again because they are celebrating the resurrection of Jesus! 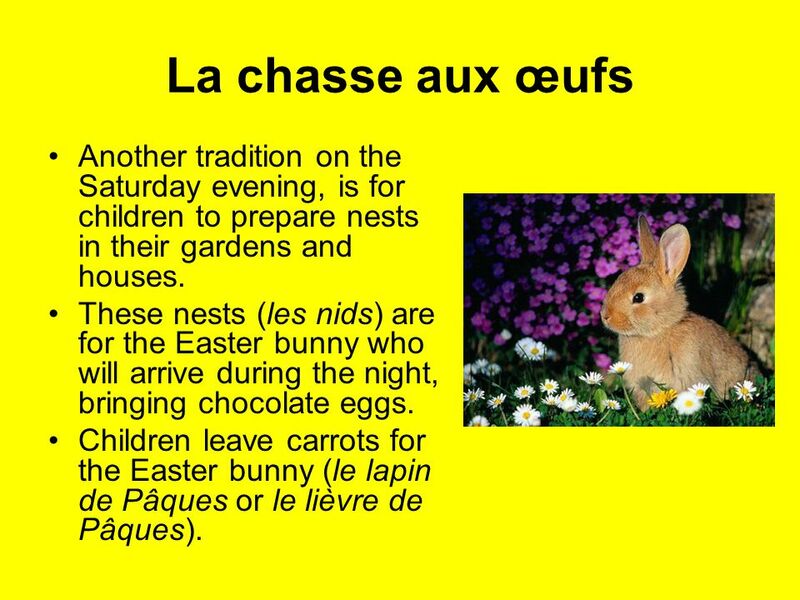 20 La chasse aux œufs Another tradition on the Saturday evening, is for children to prepare nests in their gardens and houses. These nests (les nids) are for the Easter bunny who will arrive during the night, bringing chocolate eggs. 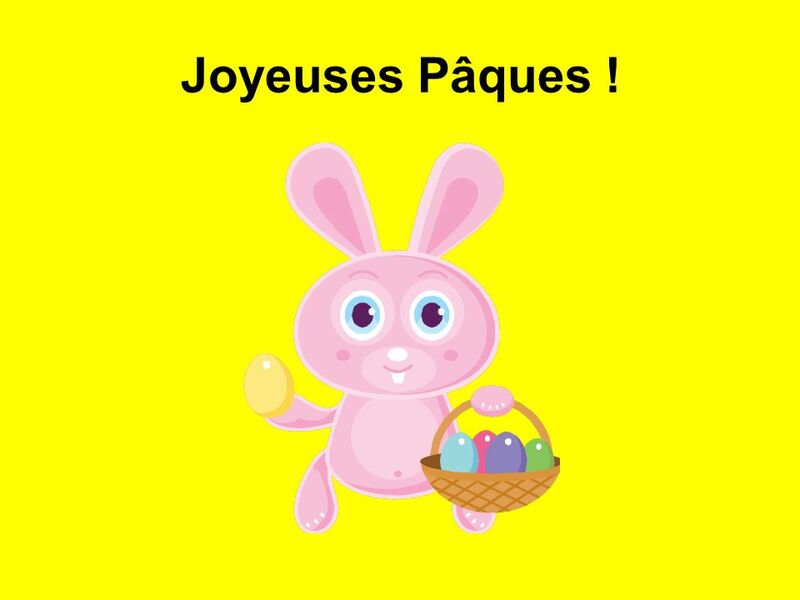 Children leave carrots for the Easter bunny (le lapin de Pâques or le lièvre de Pâques). 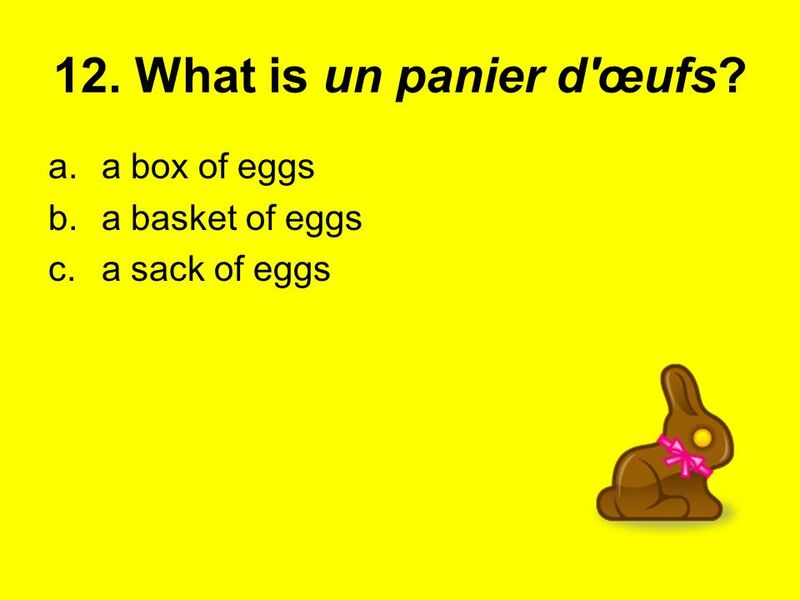 21 Les œufs de Pâques The tradition of the Easter eggs dates back from the 4th century. 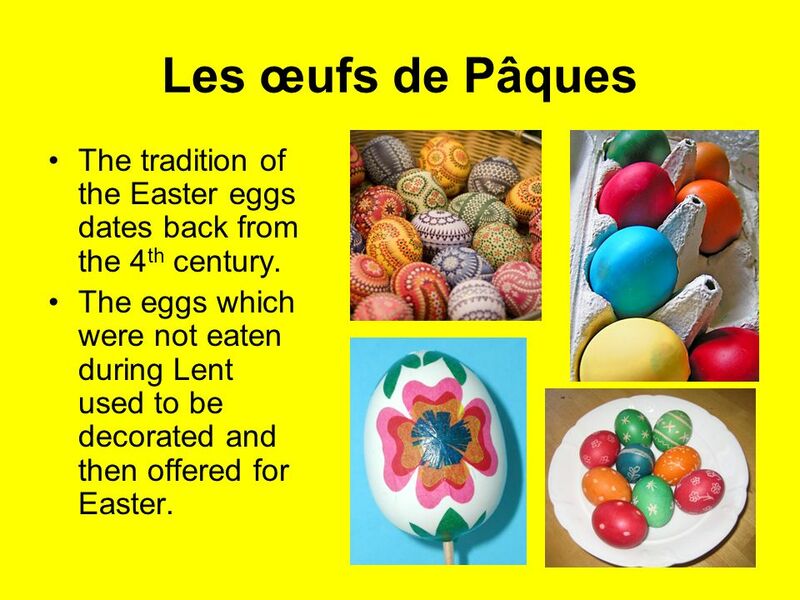 The eggs which were not eaten during Lent used to be decorated and then offered for Easter. 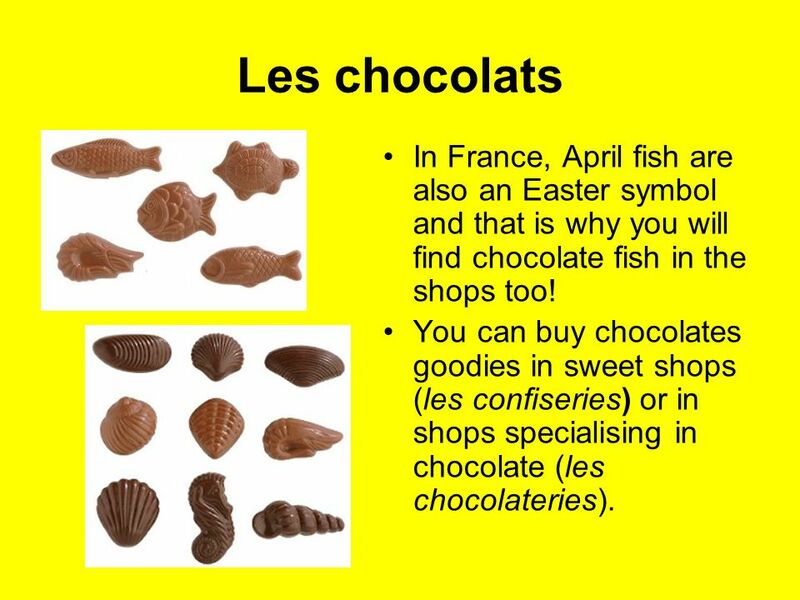 22 Les chocolats In France, April fish are also an Easter symbol and that is why you will find chocolate fish in the shops too! You can buy chocolates goodies in sweet shops (les confiseries) or in shops specialising in chocolate (les chocolateries). 23 Le repas There is generally an enormous amount of delicious food to eat. 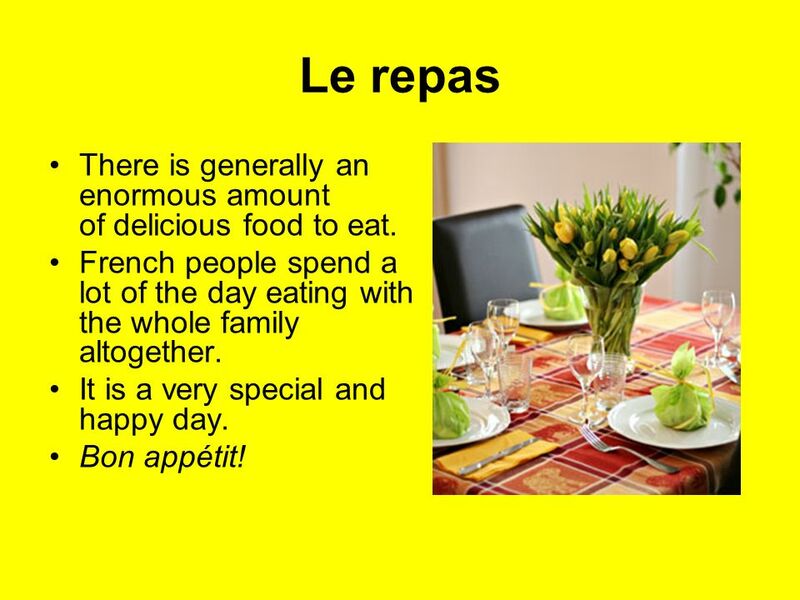 French people spend a lot of the day eating with the whole family altogether. It is a very special and happy day. Bon appétit! 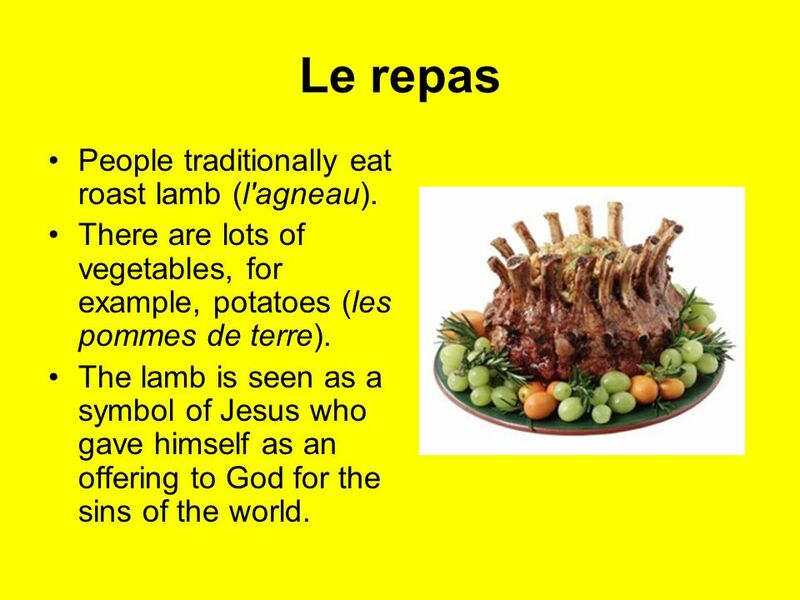 24 Le repas People traditionally eat roast lamb (l'agneau). There are lots of vegetables, for example, potatoes (les pommes de terre). The lamb is seen as a symbol of Jesus who gave himself as an offering to God for the sins of the world. 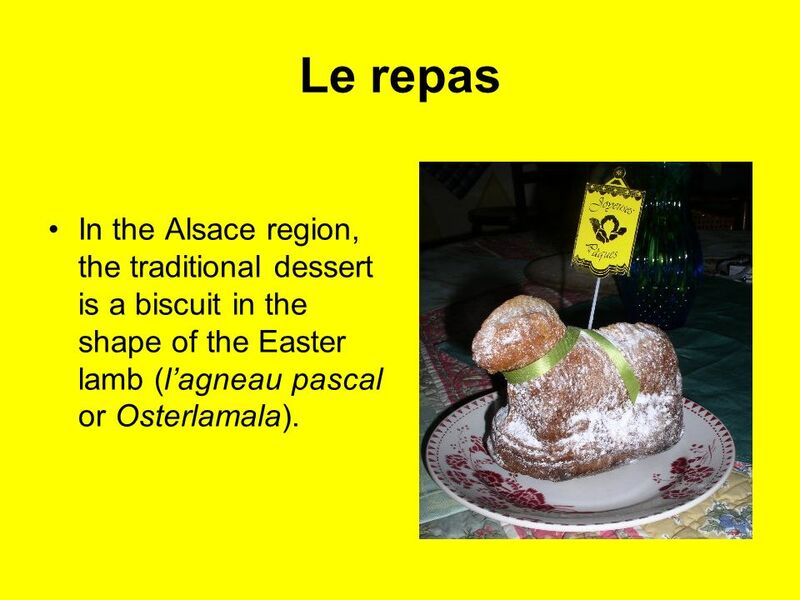 25 Le repas In the Alsace region, the traditional dessert is a biscuit in the shape of the Easter lamb (l’agneau pascal or Osterlamala). 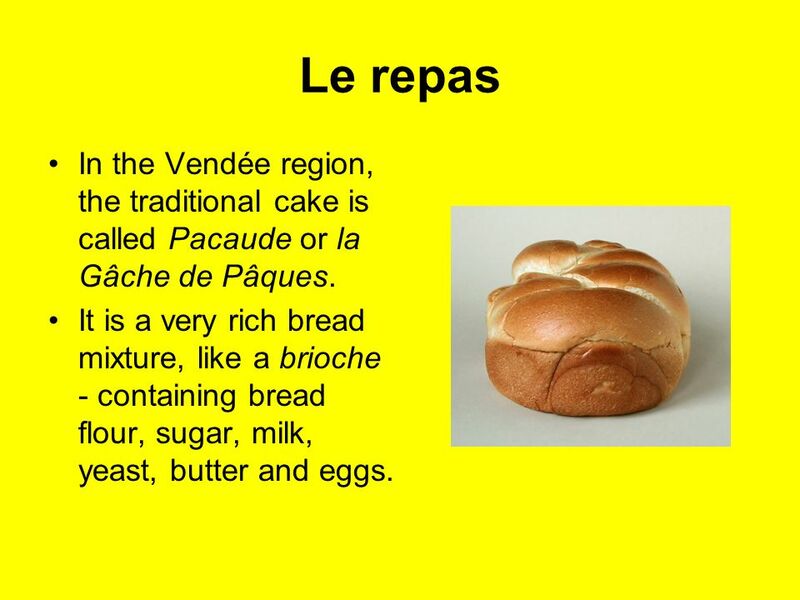 26 Le repas In the Vendée region, the traditional cake is called Pacaude or la Gâche de Pâques. It is a very rich bread mixture, like a brioche - containing bread flour, sugar, milk, yeast, butter and eggs. 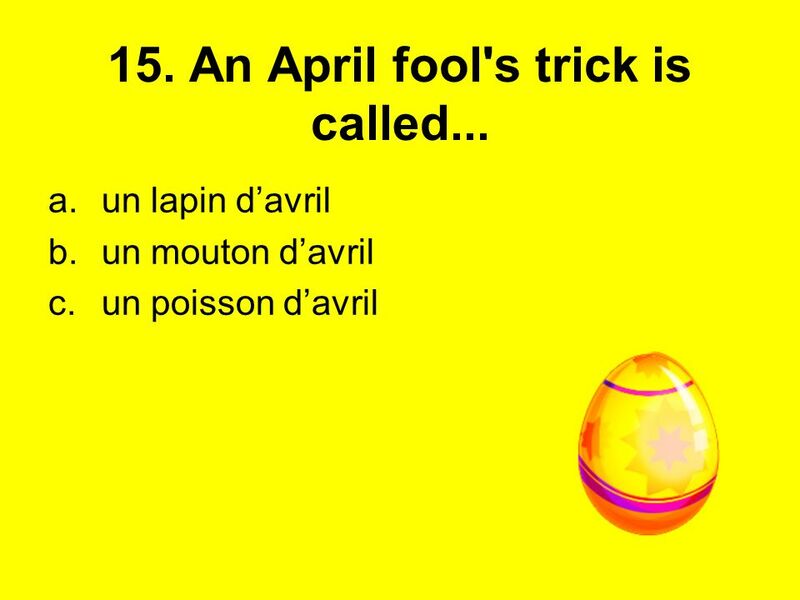 27 Poisson d’avril Another important date is April Fools’ Day, on the 1st of April. The tradition is that children play a trick on adults (parents, teachers…) by sticking paper fish onto their back. 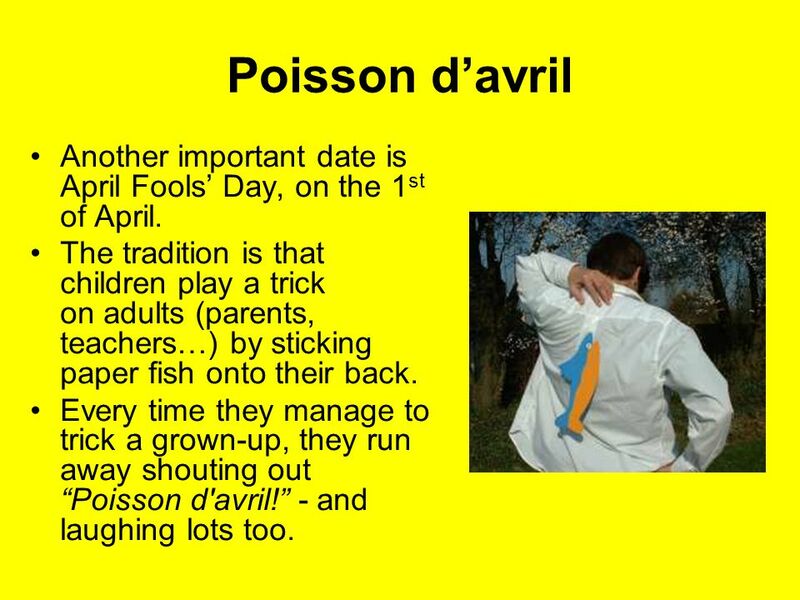 Every time they manage to trick a grown-up, they run away shouting out “Poisson d'avril!” - and laughing lots too. 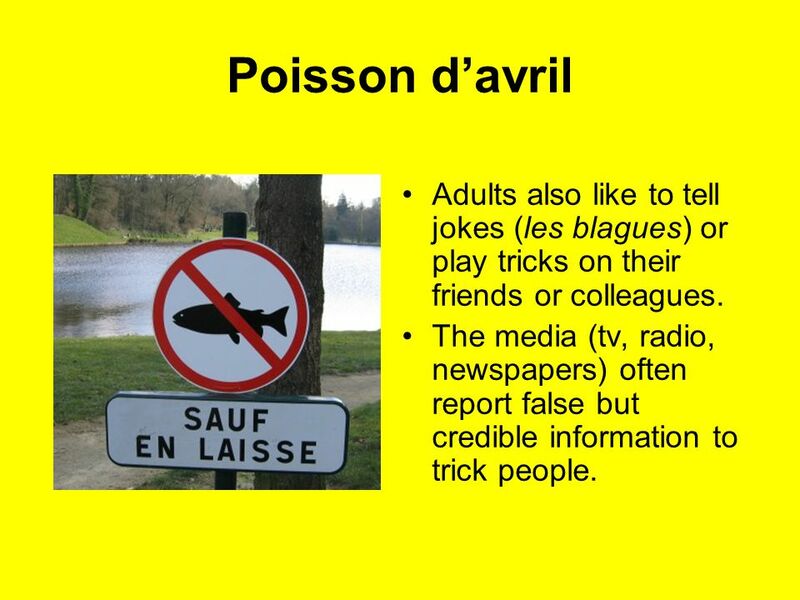 28 Poisson d’avril Adults also like to tell jokes (les blagues) or play tricks on their friends or colleagues. The media (tv, radio, newspapers) often report false but credible information to trick people. 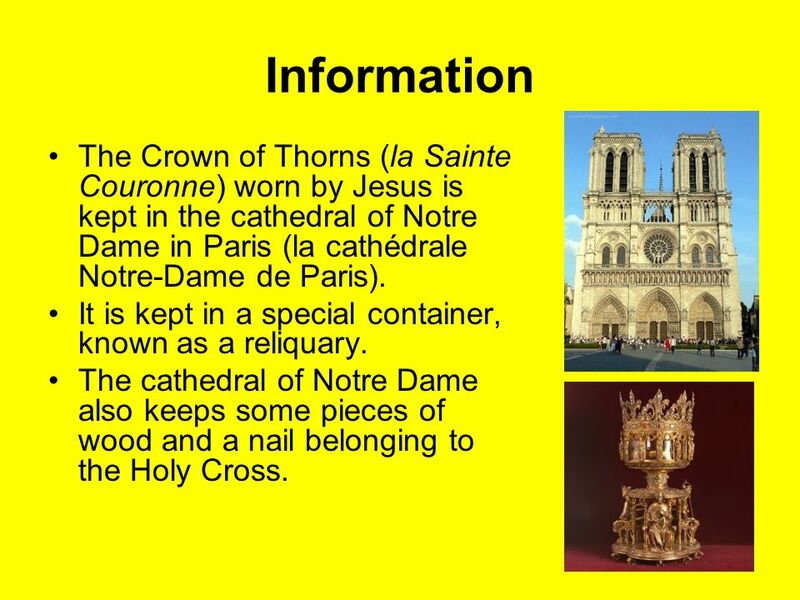 29 Information The Crown of Thorns (la Sainte Couronne) worn by Jesus is kept in the cathedral of Notre Dame in Paris (la cathédrale Notre-Dame de Paris). It is kept in a special container, known as a reliquary. The cathedral of Notre Dame also keeps some pieces of wood and a nail belonging to the Holy Cross. 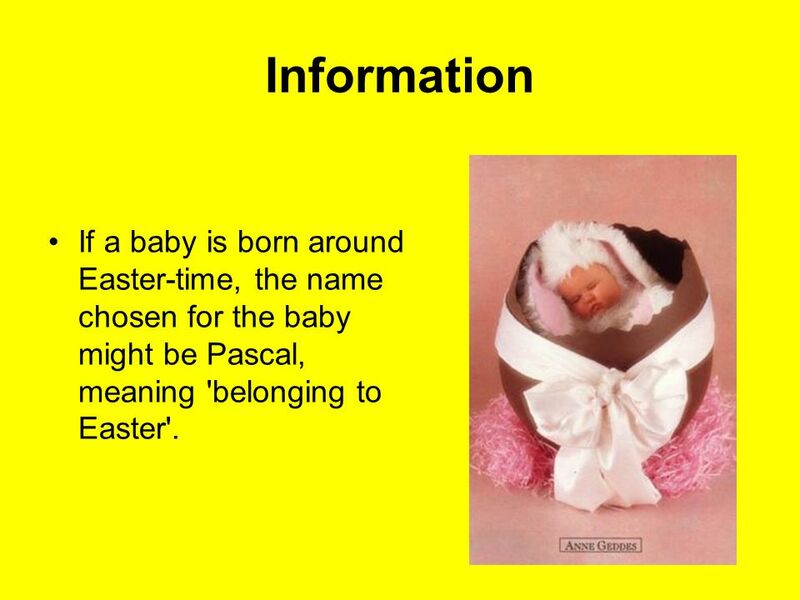 30 Information If a baby is born around Easter-time, the name chosen for the baby might be Pascal, meaning 'belonging to Easter'. 33 2. 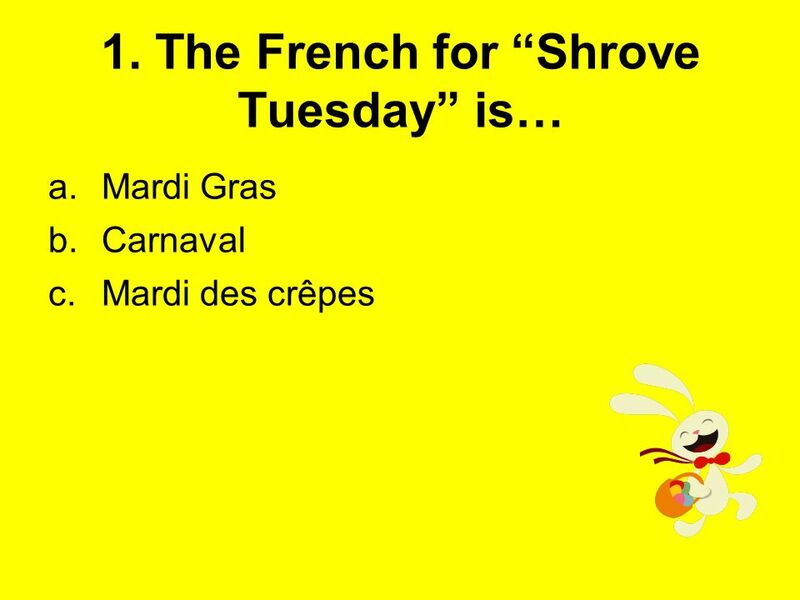 What happens in France on Shrove Tuesday? 38 7. 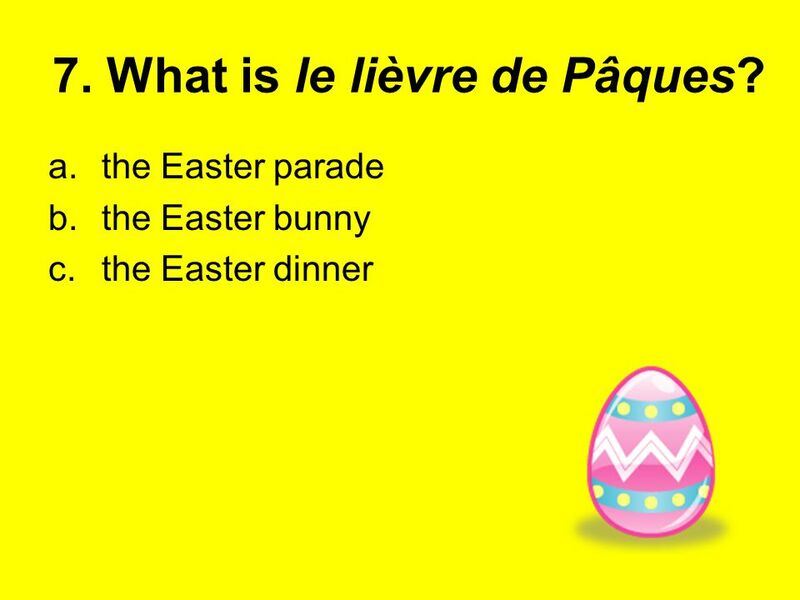 What is le lièvre de Pâques? 39 8. 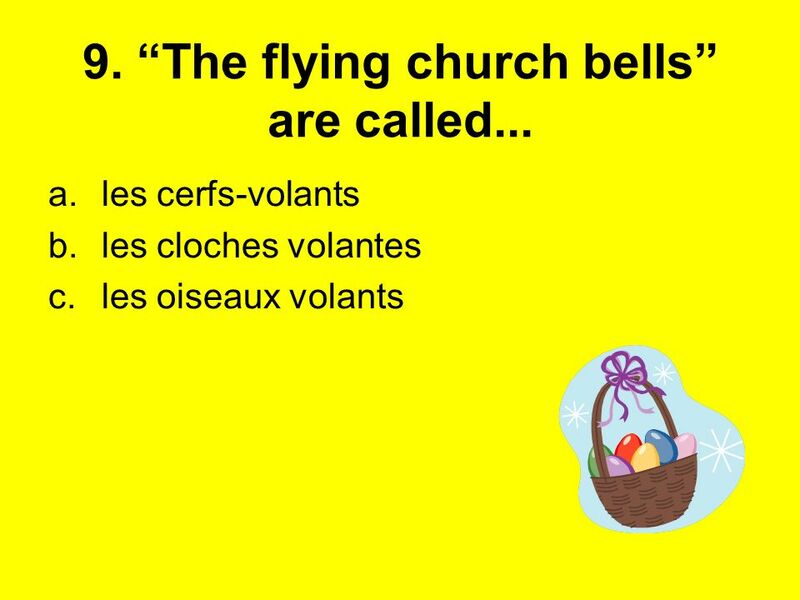 According to the French tradition, where do all the church bells fly to, at Easter? 42 11. 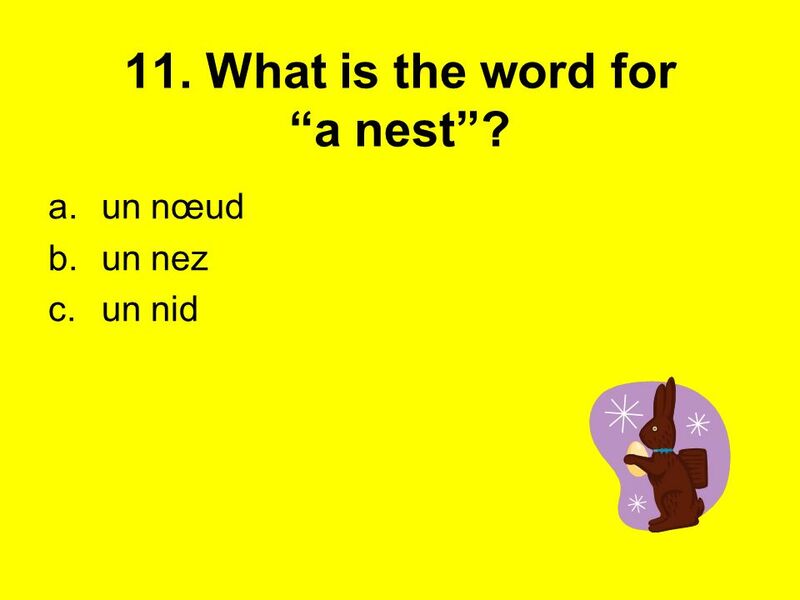 What is the word for “a nest”? 44 13. 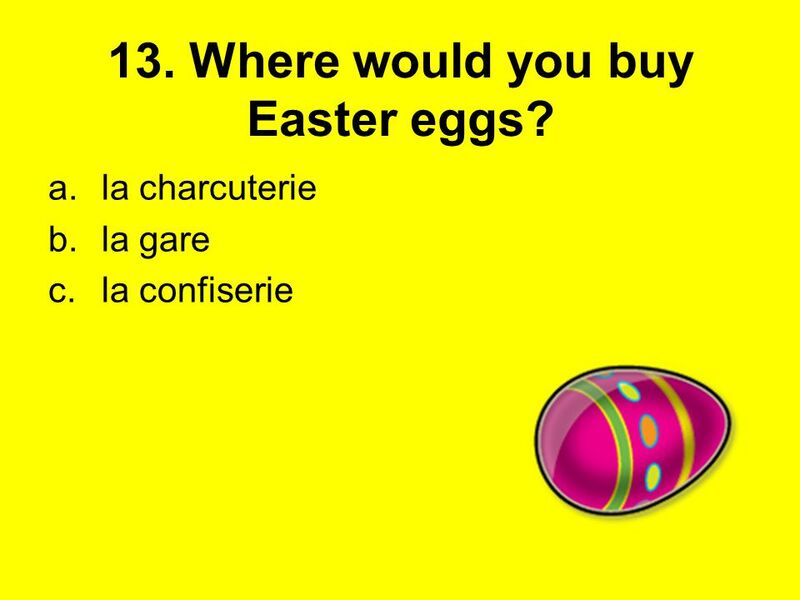 Where would you buy Easter eggs? 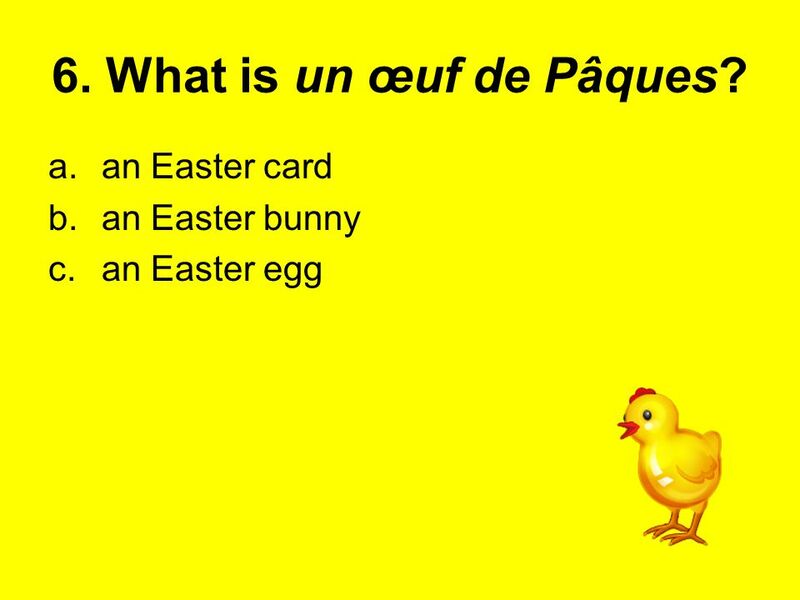 Download ppt "Objective: To learn about Easter in France"
Easter. Easter in Poland Easter, the most important and oldest Christian holiday celebrated to commemorate the resurrection of Christ. Easter religious. Easter is the most important cycle in the Christian calendar since it leads up to the commemoration of the death and resurrection of Jesus. It starts. 50: $1 Million $500,000 $250,000 $125,000 $64,000 $32,000 $16,000 $8,000 $4,000 $2,000 $1,000 $500 $300 $200 $100. Les Fêtes en France By Julia Kent 8Breen. EASTER in GREECE. EARTH Easter is celebrated the Passion, the crucifixion, burial, and finally the resurrection of Jesus Christ. The main days of Holy. 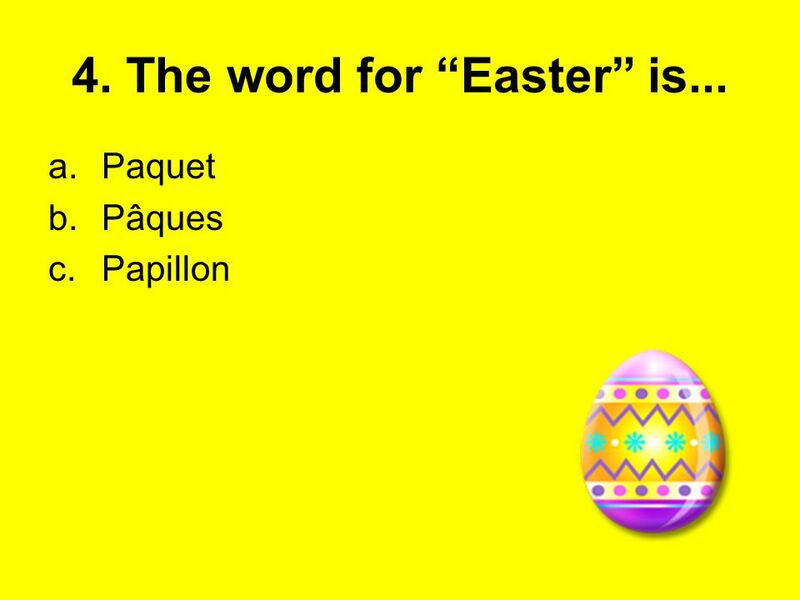 What day is Easter celebrated? 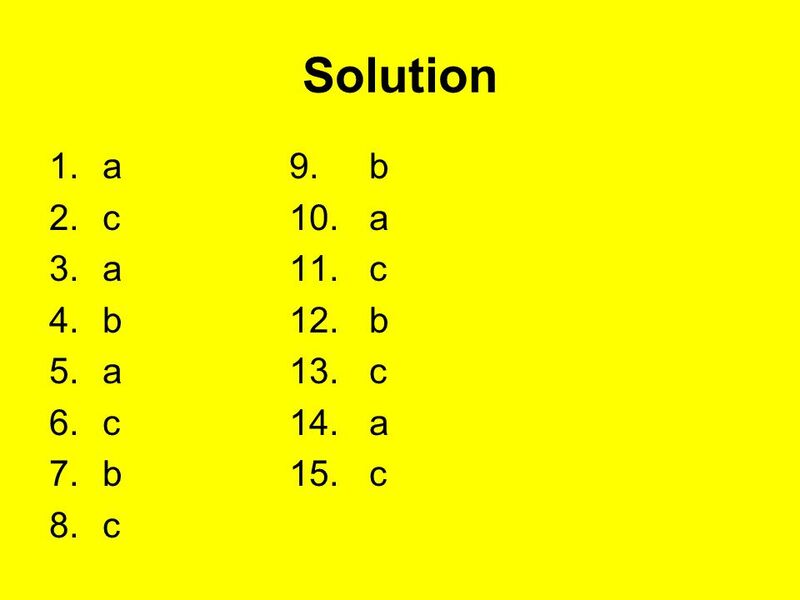  Friday  Saturday  Sunday  Monday. Easter in Greece Easter in Greece is the biggest holiday of the year and is even more important than Christmas, with week long celebrations and traditions. During Easter in Poland, we eat breakfast, we enjoy it because the Lord Jesus is risen. The day before Christmas we go to church withEaster baskets and. After 40 days of Lent comes the Easter holiday. 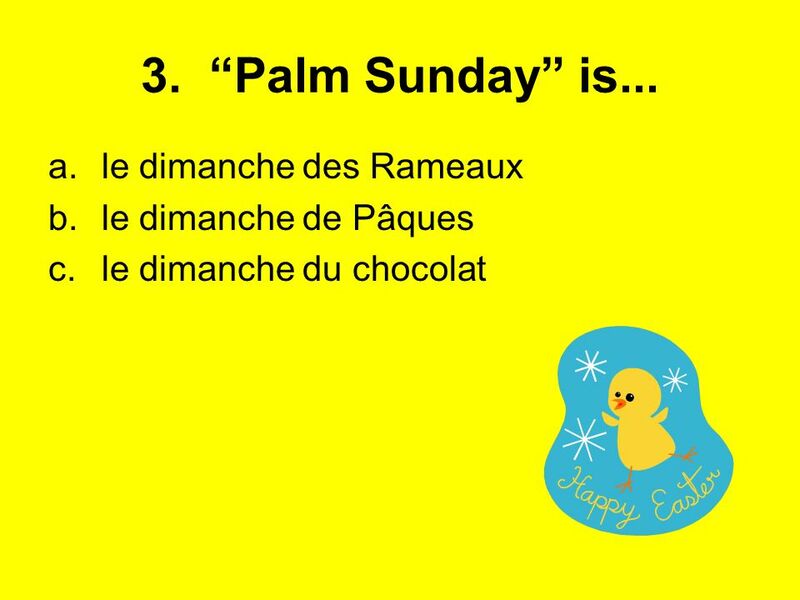 It begins with Palm Sunday. 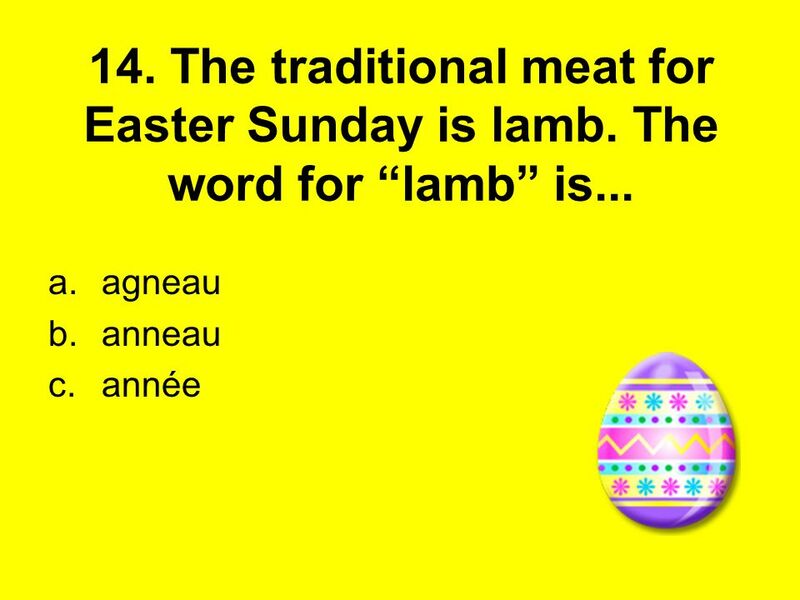 On Good Friday people are supposed not to eat meat. Religious holidays How do they influence on our way of life? Gusev Alex Kryukov John Tokareva Irena. Easter Across Africa. 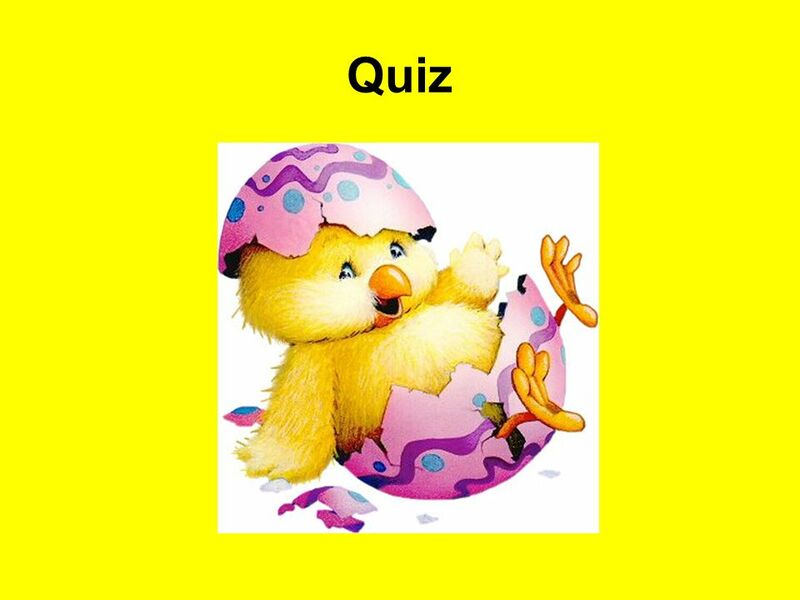 How do you spend the Easter break? Who do you spend Easter with? RELIGION Mlle Pendergest. STONES OF LENT  If we say we have no sin, we deceive ourselves, and the truth is not in us. If we confess our sins, he is.